Schalke head coach Huub Stevens (l.) on Saturday's Revierderby win: "We battled really hard and deserved to go home with the points"
SCHALKE 04: PRETENDERS OR CONTENDERS? Dortmund - FC Schalke 04 set a serious marker with their 2-1 Revierderby victory over champions Borussia Dortmund on Saturday. Local bragging rights aside, the win in Dortmund finally saw Huub Stevens' men pick up all three points against top-three opposition, something they failed to do the whole of last season. 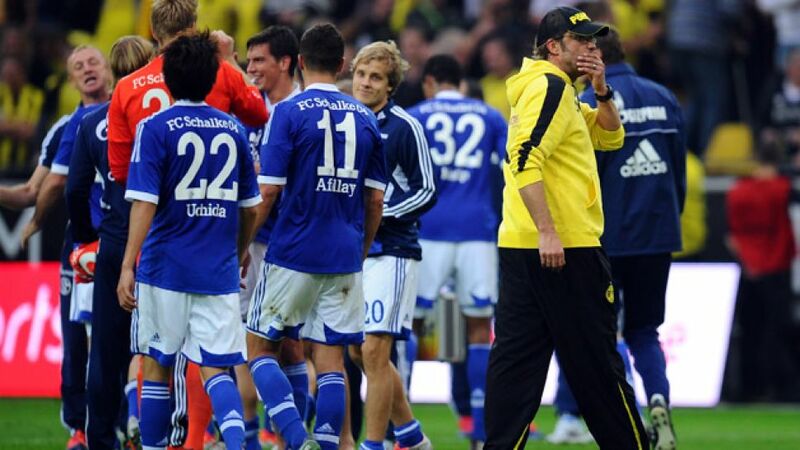 "I think we put the frighteners on Dortmund this time," said Austrain defender Christian Fuchs after the game. In the context of their first acid test of 2012/13 at home to FC Bayern Munich, the win carries even greater significance. Schalke offered virtually nothing as Thomas Müller and Co. strolled to a routine 2-0 victory at the Veltins Arena on Matchday 4, leaving the Royal Blue faithful seriously questioning their side's title credentials. Fast forward four weeks, though, and the mood in the Ruhrgebiet has seen a dramatic shift from one of top-four resignation to title-challenging optimism. Schalke earned their corn in Dortmund, subjecting the champions to their first home defeat of the campaign with the sort of display that's seen them emerge as potentially the only Bundesliga outfit capable of getting anywhere near Bayern at the top. "We battled really hard and deserved to go home with the points," declared head coach Stevens. Schalke battled to a third-place finish last term, but home and away defeats to the Bundesliga's top two cost them dearly as they finished a handsome nine points and an almighty 17 points behind second-placed Bayern and double-winners Dortmund respectively. Right now, the gap at the top is a closable seven points, while five points already separate Schalke from near-neighbours Dortmund. "It's hard to match last season's third-placed finish, but the team has the potential to do so," warned Fuchs. Of course, there's still a long way to go, but if die Knappen can dig deep between now and the winter break, especially on those days when they're not having it all their own way, February's trip to Bayern and the March visit of Dortmund may well prove to be decisive in the title race.